What Is Cold Laser Therapy, and How Does A Chiropractor Use It? While chiropractic adjustments are an excellent way of helping to adjust the body and reduce inflammation, they are far from the only types of treatments offered at your local chiropractic clinic. In fact, many of the treatments you’ll find at a chiropractic office today are more high-tech than ever. Sometimes this includes ultrasound therapy, other times the use of a Pro Adjuster. Today we’re going to look at one of the most technologically advanced pieces of equipment you might experience at a chiropractic clinic: a cold laser therapy machine. Cold laser therapy is sometimes known as LLLT therapy, or Low-Level Laser Therapy. Other names include low-power laser therapy, soft laser biostimulation, and photobiomodulation. These lasers are tuned to a very specific frequency so that they gently interact with tissues in the body. The low levels of energy used are not enough to directly heat the skin. Cold laser therapy works by using the light to stimulate the cells inside the body. Invisible wavelengths on the light spectrum are delivered to the cells, causing the light-sensitive elements of the cell to be stimulated. This can increase blood flow to the cells, which therefore also increases their oxygen intake and speeds healing. LLLT is used on nearly any part of the body that has pain. This means any place a chiropractor believes increased blood flow will help, such as joints and discs. The primary uses of cold laser therapy are to reduce pain, inflammation, edema, and to reduce healing time of injured areas. What Can You Expect During LLLT Treatment? The chiropractor or clinician will get you comfortable in the appropriate chair or on a table, depending on the part of the body to be treated. The area is exposed and the laser device — about the size of a flashlight — touches the skin and may be moved around to ensure the area in question is hit by the low-level laser. The device is usually used for as little as 30 seconds to as many as five minutes or more. An area in greater pain or that covers a larger area of the body may require more time. The laser has different settings depending on the depth of the area inside the body to be treated. These settings change the wavelengths of the light from around 600 nanometers for shallow pain to 950 nanometers in order to target deeper pain (or to get through deeper tissue on a heavier patient). As we mentioned in this article that detailed the level of pain involved in chiropractic procedures, there’s no pain associated with cold laser therapy. At most you might feel a bit of tingling in the area due to increased blood flow in the area. Not only is there no pain, but there’s no ionizing radiation and no risk of cell damage. Cold Laser Therapy Or Ultrasound? Ultrasound therapy is another type of treatment you might find in a chiropractor’s office. Instead of using light waves like LLLT does, ultrasound uses sound waves that are above the range of human hearing. While most people think about in-utero baby imaging when they hear the word ultrasound, therapeutic ultrasound uses a different wavelength of sound and has no image-receiving head. 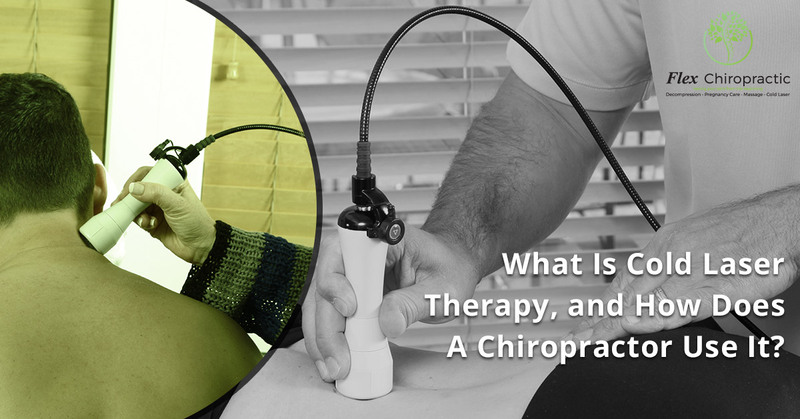 If your chiropractor offers both LLLT and ultrasound, which should you choose? We’d suggest listening to the doctor’s opinion. Both have their advantages, but the better option might come down to the severity of the injury, where it is in the body, and your body type. The are some instances in which using both is advantageous, so we advise simply taking your chiropractor’s advise. The primary disadvantage of cold laser therapy is that it doesn’t tend to offer immediate relief. It’s a slow process that builds over time, so eight or more sessions (typically twice a week, but check with your chiropractor) may be needed to see good results. Let Our Chiropractic Clinic Help! Cold laser therapy is often used in conjunction with other services you find in a chiropractic office. It’s seldom used alone but can be an excellent addition to other forms of high-tech and traditional chiropractic care. If you’re experiencing pain, we’d very much like to help you. Contact our chiropractic office in Columbia and Lexington at the first sign of pain!